Enabling Michael to follow his true passion for plants - now getting paid to do what he loves! For those of you who may not know, my core business is ePlants Trade, Production Nursery on Queensland's Sunshine Coast. Several months ago, I had a prospective employee approach me for a nursery hand position at ePlants. There was something very special about this one. His name was Michael and he was a paraplegic with a hearing impairment. Not your ideal candidate for a nursery position, a challenging environment to say the least. However, I have a philosophy that everyone deserves a little of your time, especially those who work up enough courage to visit our nursery in the hope of securing a job. Michael was accompanied by a lovely gentlemen by the name of Ben from JobMatch https://jobmatchemployment.com.au/. Ben's job was to match people with disabilities to a suitable job. Ben had a real challenge on his hands! In the first meeting with Michael it wasn't long before it was apparent that Michael revealed his true passion for plants. He had my attention. Then from his pouch at the back of his wheel chair, he pulled out and handed me a list of botanical names of plants that he had personally typed out. The enthusiasm from this prospective employee shone through like none other I had ever experienced. To this day, I have never had anyone sell themselves in an interview the way Michael did. After sometime spent talking and wheeling around the nursery, taking a good look around, the seed was planted. Ben, Michael and I were going to work on the project of making this happen. Michael left the interview on a very high note, announcing that he was now off to play his sport - pool (billiards/snooker). I thought to myself what an inspiration, and I had a smile on my face as I waved him goodbye! 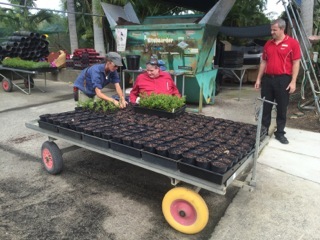 ln order for Michael to commence work with ePlants it meant the construction of disabled facilities - being a new bathroom and a concrete ramp to access his work station. This took sometime to organise, many months in fact but as they say "good things come to those who wait". It was an absolute pleasure working closely with Ben from Jobmatch from start to finish, from challenge to obstacle, to triumph.Receiving the good news that ePlants was approved for a government grant to the value of $30,000 made it all worthwhile as this provided the funds which made it all possible. For all those involved this was "music to our ears" and we are all very grateful. 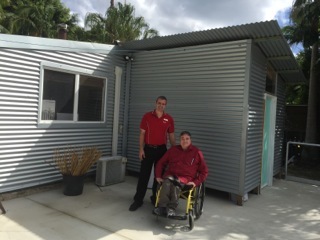 Also special thanks to the team at Sunshine Butterflies http://www.sunshinebutterflies.com.au who constructed the ramp and bathroom facilities for the project. 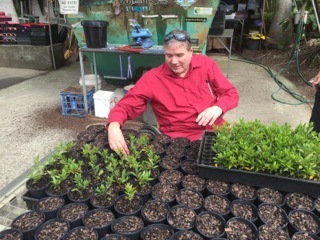 It is with great pleasure that today we welcome to ePlants our newest team member Michael who is now following his true passion for plants, now getting paid to do something that he loves. It is smiles all round. Some say "the feeling you receive when making a difference to the quality of someone's life, is what we are all here for". I must say "it really does feel good". Michael is a true inspiration. He has a genuine passion for plants which aligns with ePlants core values which is to care, love and appreciate people, plants, animals and all living things therefore we are a perfect fit. For these reasons ePlants decided to proceed with the challenging project of making structural amendments to our premises to make this all happen for Michael and for ePlants. We feel privileged to be a part of Michael's journey working with plants, empowerment, independence, growth and belonging to a team. Here are some snap shots of Michael enjoying his first day on the job. What is the perfect match for an employer and employee? A job well done and a satisfied employee is a good start. Suncoast Gold Macadamias and Adam Streat is the perfect match. 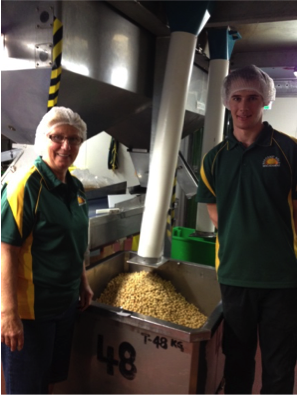 There are numerous jobs at Suncoast Gold Macadamias and making the boxes for the production line was one job that had a high turnover. That was until Adam was given his opportunity 5 years ago. Adam faced a number of barriers to employment and sought assistance through the specialised employment agency Jobmatch Employment. At that stage he was unsure of the type of work he wanted but was determined to find work and following initial training and support, become independent in his job. Jobmatch approached Suncoast Gold Macadamias about positions they may have available. Following an interview, he was selected for the position and he has not looked back. When asked about his work his answer is immediate. “What is there not to like. I work with a great bunch of people, learn new skills and gain confidence every day” was his response. And what are Suncoast Gold Macadamias thoughts on Adam. “He is a valued employee. Always on time, reliable, gets on well with all staff and in busy times is always prepared to do extra time to help meet deadlines” was the comments of his supervisor Marj Cutmore. “Young people looking for work could take a leaf out of Adams book.”Adam is saving to buy a car and is in the process of obtaining his drivers licence. Brian Feekings is a man who does not let barriers get in his way. For 20 years till 1994 he had been a Merchant Seaman with the Australian National Line (ANL). Health issues finished this career and he became self-employed as an owner operator working in the area of earth moving. Brian’s health deteriorated further and he had to give up work completely. 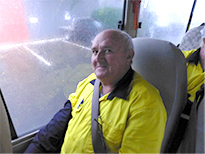 After ten years on Disability Support Pension, Brian felt he could attempt work again. He knew he would need help after such a break and registered with Jobmatch to get the necessary assistance to help him back into employment. Brain was unsure of what he would be able to do but felt he could have a new career in the Mining Industry. Energy Skills Qld (ESQ) were running a course in Hospitality/Camp Operations specifically designed to cater for the Mining Industry and Brian saw this as his chance to get a foot in the door. He knew he would gain the skills needed if only he could be given a chance. He attended the information sessions and then undertook the 13 week full time course completing a Cert 11 in Hospitality. Brain is now confident and skilled and is ready to start his new career. He is departing for WA in the near future with contacts in place to give him an opportunity to start this new period of his life.